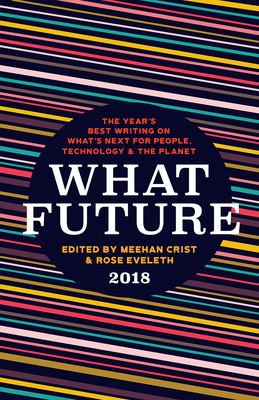 What Future: The Year's Best Writing on What's Next for People, Technology, and the Planet, edited by Meehan Crist and Rose Eveleth, is a best of the year anthology featuring new writing by and about the scientists, writers, journalists, and philosophers who are proposing the options that lay not just ahead, but beyond us. Meehan Crist is writer-in-residence in Biological Sciences at Columbia University. Previously she was editor-at-large at Nautilus and reviews editor at the Believer. Her work has appeared in publications such as the New York Times, the Los Angeles Times, the New Republic, the London Review of Books, Tin House, Nautilus, Scientific American, and Science. Awards include the 2015 Rona Jaffe Foundation Writer's Award, the 2016 AOA Award for excellence in Health Journalism, the Olive B. O'Connor Fellowship and fellowships from MacDowell, The Blue Mountain Center, Ucross, and Yaddo. She is the host of Convergence, a live show and podcast about the future. Rose Eveleth is a producer, designer, writer and animator based in Brooklyn. She's dabbled in everything from research on pelagic invertebrates to animations about beer to podcasts about fake tumbleweed farms. These days, she explores how humans tangle with science and technology. She's been a columnist for BBC Future and Motherboard, the producer of the Story Collider, the special media manager at Nautilus, a new digital magazine about science, culture and philosophy and the managing editor for LadyBits, a place where women are smart about science. She also edited the Smart News blog at Smithsonian Magazine, and founded Science Studio, a home for all the best science multimedia on the web. Even before that she was an editor of all things animated at TED Education, and a contributing editor at Smart Planet. Most recently she helped ESPN's award winning documentary series 30 for 30 launch their podcast and is currently the producer and host of Flash Forward, a podcast about the future.